vol.4 see all recipes I’ve put together a series of tasty recipes for healthy Japanese dishes that are simple to make, wherever in the world you might be. 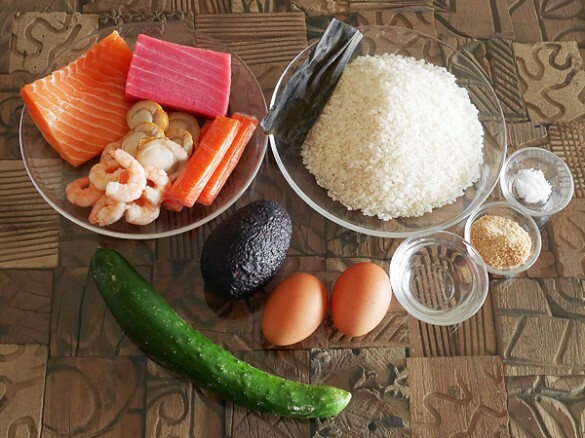 I hope you’ll enjoy mastering Japanese home cooking while learning how to use ingredients that are good for health and beauty. 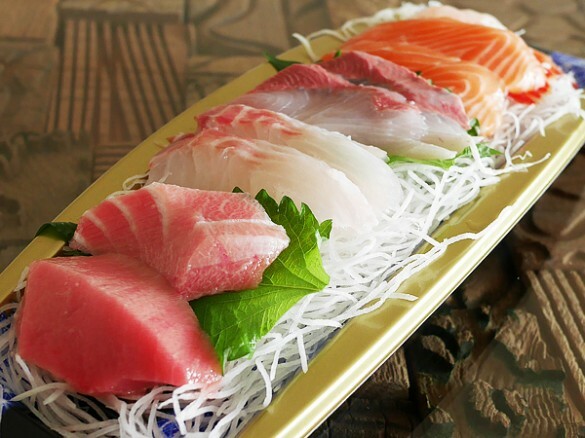 The quintessentially Japanese dish that adds a touch of glamor to the table at any celebration is sushi. Among the various types of sushi, chirashizushi in particular is a party favorite, served on a large plate that showcases its colorful ingredients to best effect. As you share out this tasty sushi for your guests, it’s almost like you’re sharing happiness itself. Unlike many luxury dishes, it’s also good for you. The secret lies in the rice, which is mixed with a sweet vinegar. This inhibits the spike in blood sugar that you get with ordinary white rice, ensuring that you won’t put on weight. 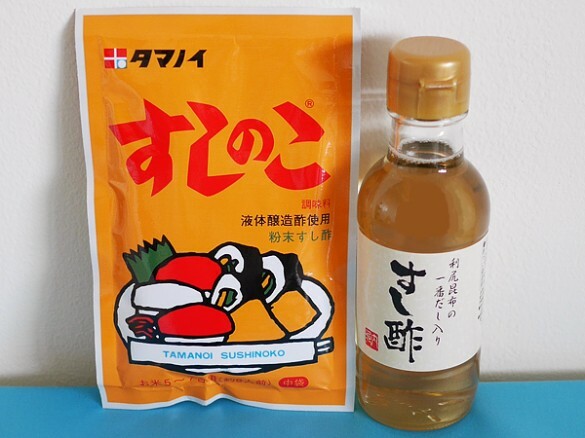 In Japan, you can buy pre-prepared “sushi vinegar,” which makes a great souvenir of any trip to Japan. The raw fish used in the ingredients is rich in the healthy oils DHA and EPA, which are attracting attention for their anti-aging effects and ability to maintain the youthfulness of brain and blood vessels. 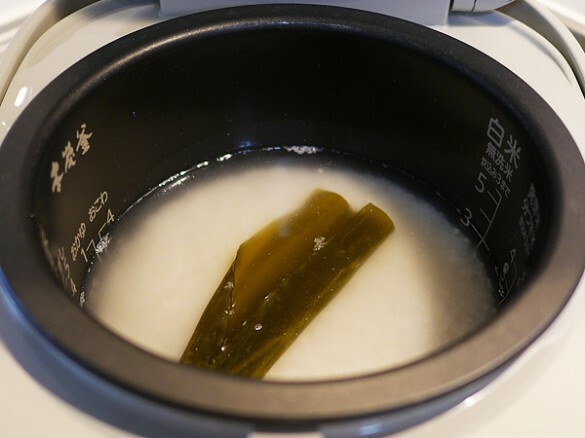 (1)Cook the white rice with the dried kelp. 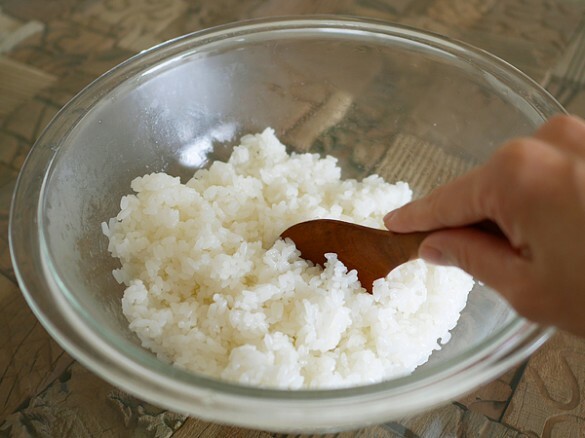 Use about 10% less water than usual, to give the rice a firmer texture. (2)Make the kinshi-tamago egg strips. 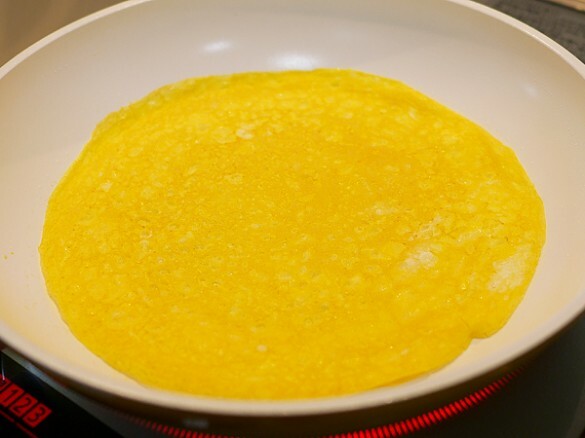 Brush a frying pan with oil and heat it up, then pour some of the beaten egg into the pan and cook it on both sides, like making a thin crepe. Keep the heat low. You should have enough beaten egg to make 2-3 of these thin omelets. 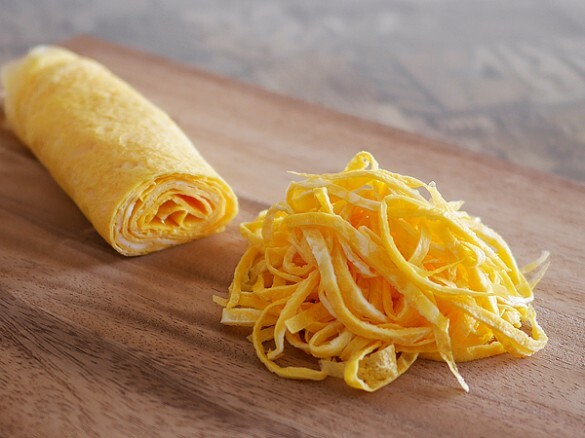 (3)After allowing the thin omelets to cool, stack them on top of each other, then roll the stack up and slice it into thin, thread-like strips. Use your hands to disentangle the strips into a fluffy heap. 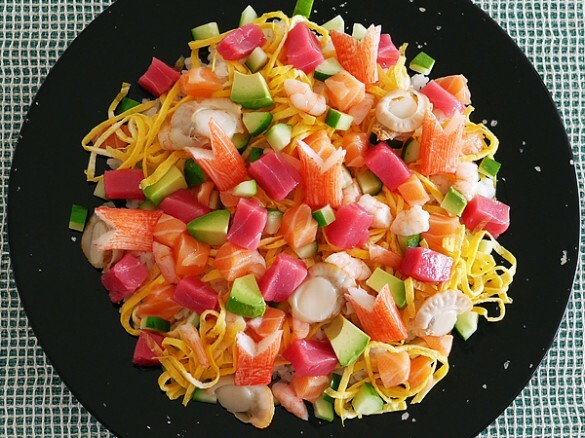 (4)Cut the raw fish, shrimps, scallops, crab sticks, cucumber, and avocado into bite-sized pieces. (5)Make the vinegared rice. While the rice is cooking, combine the vinegar, sugar, and salt. Once the rice is cooked, transfer it into a bowl while it is still hot, then add the sweetened vinegar mixture and mix it in quickly. 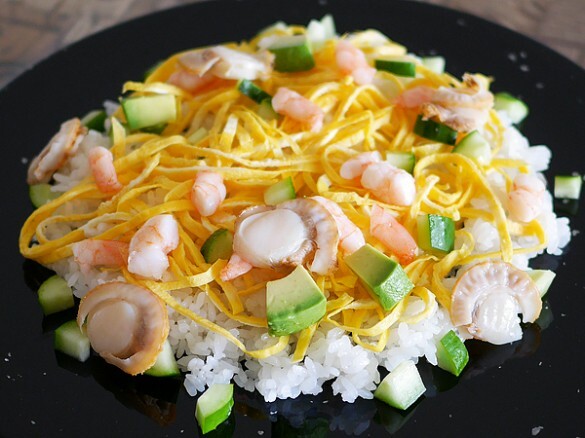 (6)Spread the vinegared rice onto a large plate and top with the other ingredients. 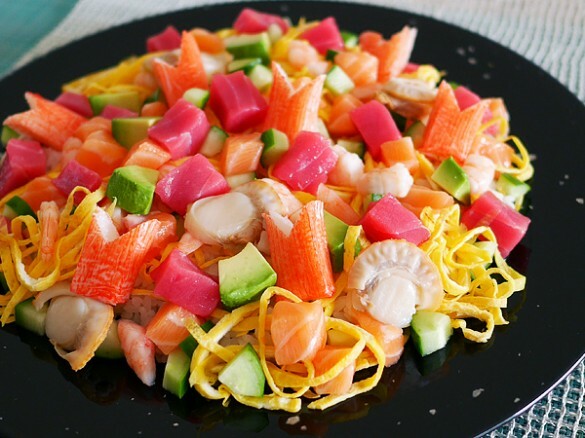 Start with the kinshi-tamago egg strips and vegetables. 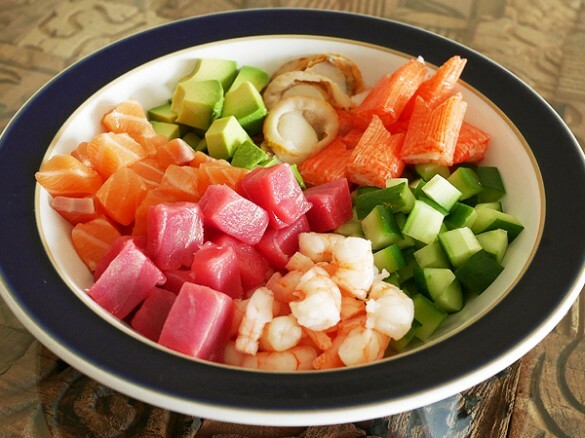 Then scatter the seafood over it, taking care to get a good balance of color. (7)Once you’ve added all of the ingredients, it’s ready to serve. (8)Share it out among your guests, providing soy sauce and wasabi as accompaniments that they can add as they wish. TEXT,PHOTO/SUGI AKATSUKI see all recipes Profile:SUGI AKATSUKI Graduate of the University of Tokyo. Researches culinary culture and foods that promote longevity and beauty. Studied basic medical science and life science at university. After studying organic food and Kushi macrobiotics, she began to conduct culinary research independently. Her motto is “simple ways to stay beautiful.” Her specialty is healthy dishes ideal for the busy woman of today. She also teaches yoga and has a popular blog(http://saqai.com/).